After Momoshiki was defeated by Boruto, Momoshiki appeared to him in the anime (Episode 65, 18:37) and told Boruto; "You cannot see through your own destiny, But I can see your destiny very clearly"; as he said this, he started using his Byakugan. The phrasing is very different in the manga. Is this power to see into the future a hidden ocular ability of all Byakugan users? (more like the way all Mangekyous have special traits across the different Uchihas) Or was Momoshiki just trying make his words seem legit by "claiming his Byakugan had such an ability". Also, when he told Boruto that "those blue eyes will eventually take everything from you!" was it metaphorically? 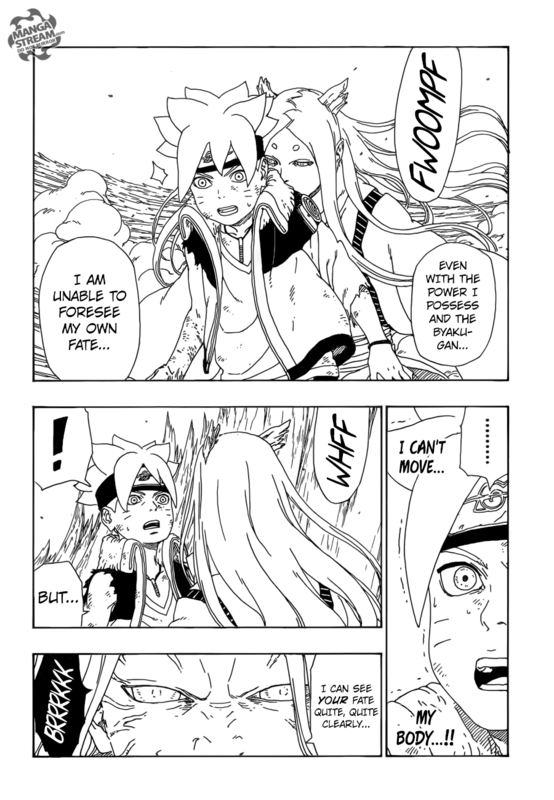 (like some sort of japanese saying/ figure of speech) or did he mean Borutos Jogan? I've been thinking about it for a while now and it doesn't really add up.